March 1st begins the thirty day countdown to the release of my ebook entitled “Love’s Harvest.” Based on the Biblical book of Ruth, part of the story takes place in the Volga Region of Russia. Flowing through central Russia and draining into the Caspian Sea, at nearly 3,600 km, the Volga River is Europe’s longest river. 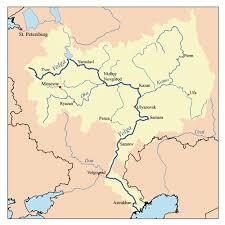 Eleven of the twenty largest cities in Russia are in the Volga’s watershed. Often referred to as Mother Volga, the river has significant symbolic meaning in Russian culture. “Love’s Harvest” involves a German man and his English wife who move to the region shortly after WWI. The couple join the myriad Germans and immigrants from other countries who had been recruited to Russia in the 18th Century under Catherine the Great. Over one hundred colonies were established between 1764 and 1772, where all populations were allowed to maintain their culture, language, traditions, and churches. Many of the immigrants made the decision to move to Russia to get away from war-torn Central Europe that had suffered under the Seven Years’ War. By 1798, there were nearly 40,000 German speaking residents in the colonies along the Vola River. Immigrants had been promised they could go where they wanted to in Russia and many wanted to pursue their trades near St. Petersburg where a large German community had formed under Peter the Great. The promise was broken, and settlers were told where they would reside. Despite their disappointment, most decided to stay, most of them young families. The German state of Hesse-Darmstadt (where my ancestors came from) had the most representation. The Volga colonies prospered, and by the late 1800s the number of communities had nearly doubled. The population had increased to several hundred thousand people. Settlements located on the west side of the river were referred to as being on the Bergseite or hilly side, and settlements on the east side were referred to being on the Wiesenseite or meadow side. In 1874, emigration out of Russia began in response to the compulsory military duty for young men. Canada and the United States were the destinations of choice, with Lincoln, Nebraska being the most popular. After Nazi troops invaded Russia in June 1941, the Soviet government considered the Volga Germans potential collaborators, and transported many of them eastwards to such locations as Siberia and Kazakhstan. At the war’s end, many of the remaining Volga Germans left the area, and by the 1980s the region had been emptied of ethnic Germans.